After only a year of living here, we finally have all of our home canned goods sorted. We started out wanting them one place that we were going to do a ton of things to, and that never happened, so much of it stayed stored in the milk crates that we moved them in. (twice!) That’s no good, obviously, and as we added to the stash, the whole thing became a huge mess. It was hard to know what we had, hard to find anything, and generally awful. The way we’ve usually split the duties of canning is that I do most of it, Frank helps, then it’s his job to both find some place to store it and then find it again when I need it. 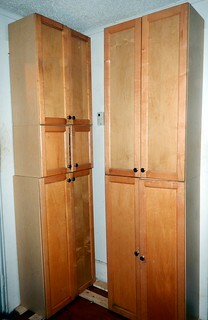 We had an entire wall of cabinets in the house in Marlow, awkwardly store in the spare bathroom (don’t ask), but it was right next to the kitchen and worked. It looked weird. Okay, it was weird, but it worked. When we had designed that house, it was before we’d started farming at all, and though I had wanted a walk-in pantry, it just didn’t work with the weird layout of the house. We’ve now taken those same cabinets and reconfigured them so that they are floor to ceiling in the living room, right next to the kitchen. Again it looks weird, but whatever. This house is tiny, there is no storage space whatsoever, especially in the kitchen, and at least it’s all in the same place and vaguely organized, even. When I know what I have, I’m more likely to use it. 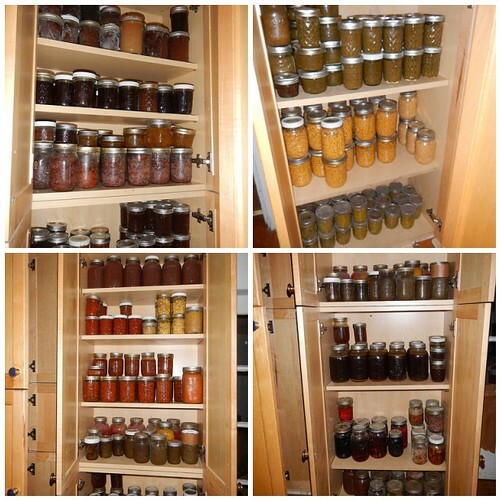 I also won’t hoard things when I can see that I still have half a dozen jars. Most of the jars are sealed with the reusable Tattler lids at this point. I mostly like them, except that our practice of writing the contents on the lid with a Sharpie doesn’t work anymore, because those lids stain. They also stain from tomato products like pasta sauce and salsa, and that bugs me. They are coming out with some colors which will mask that, and I’ll probably get some of those. The lids have no BPA in them, which is important to me, and it feels greener to use a reusable product. We still make some stuff with the disposable metal lids, things for sale and things to give away as gifts. I do that a lot. Although, to be honest, if I’m doing the entire canning project on my own because Frank’s not around? I totally cheat and use the disposables most of the time. They are definitely easier to use. The Tattlers take fiddling to put on properly, and Frank knows where all the different bits are stored, and blah. I punt and pull out the disposable lids because I can do those practically in my sleep. Plus, silly woman that I am, I miss the pings! that the disposable lids make as they seal. It’s a little affirmation of a job done properly, like a gold star. I tweeted once that Tattler should make an app with a sound of some sort for all of us who miss the pings. Here’s a peek inside. 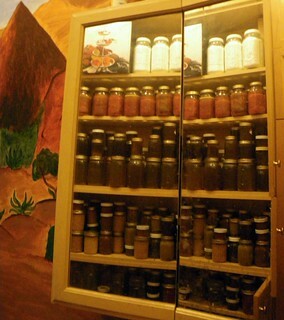 We have many different types of stock, pork, dill relish, green enchilada sauce, corn, salsa, cider, corn relish, pasta or pizza sauce, blueberry jam, blackberry jelly, apple jelly, corn cob jelly, peach jam, banana jam, orange marmalade, grapefruit marmalade, black beans, pinto beans, pickles, dilly beans, and apple sauce. We have a small number of things still for sale if you are looking for a stocking stuffer! And don’t forget a calendar. This entry was posted in Canning. Bookmark the permalink. Post a comment or leave a trackback: Trackback URL.